COLUMBUS, Ohio -- Engineers at Ohio State University are developing a technique for mass producing computer chips made from the same material found in pencils. Experts believe that graphene -- the sheet-like form of carbon found in graphite pencils -- holds the key to smaller, faster electronics. It might also deliver quantum mechanical effects that could enable new kinds of electronics. Until now, most researchers could only create tiny graphene devices one at a time, and only on traditional silicon oxide substrates. They couldn’t control where they placed the devices on the substrate, and had to connect them to other electronics one at a time for testing. 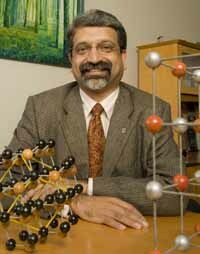 In a paper published in the March 26 issue of the journal Advanced Materials, Nitin Padture and his colleagues describe a technique for stamping many graphene sheets onto a substrate at once, in precise locations. “We designed the technique to mesh with standard chip-making practices,” said Padture, College of Engineering Distinguished Professor in Materials Science and Engineering. Graphene is made of carbon atoms arranged in a hexagonal pattern resembling chicken wire. In graphite, many flat graphene sheets are stacked together. “When you write with a pencil, you leave graphene sheets behind on the paper,” Padture said. Each sheet is so thin -- a few tenths of a nanometer (billionths of a meter) -- that researchers think of it as a two-dimensional crystal. "Think of a stack of graphene sheets in graphite as a deck of cards. When you bring it contact with the silicon oxide and pull it away, you can ‘split the deck’ near the point of contact, leaving some layers of graphene behind." Researchers have shown that a single sheet, or even a few sheets, of graphene can exhibit special properties. One such property is very high mobility, in which electrons can pass through it very quickly -- a good characteristic for fast electronics. Another is magnetism: magnetic fields could be used to control the spin of graphene electrons, which would enable spin-based electronics, also called spintronics. Yet another characteristic is how dramatically graphene’s properties change when it touches other materials. That makes it a good candidate material for chemical sensors. In this method, Padture and his Ohio State colleagues carved graphite into different shapes -- a field of microscopic pillars, for example -- and then stamped the shapes onto silicon oxide surfaces. “Think of a stack of graphene sheets in graphite as a deck of cards. When you bring it contact with the silicon oxide and pull it away, you can ‘split the deck’ near the point of contact, leaving some layers of graphene behind. What we found through computer simulations was that the graphene surface interacts so strongly with the silicon oxide surface that the chemical bonds between the graphene layers weaken, and the lower layers split off,” Padture said. In this first series of experiments, the Ohio State researchers were able to stamp high-definition features that were ten layers thick, or thicker. The graphite stamp can then be used repeatedly on other predetermined locations on the same or other substrates, making this a mass-production method, potentially. They used three different kinds of microscopes -- a scanning electron microscope, optical microscope, and atomic force microscope -- to measure the heights of the features, and assure that they were placed precisely on the substrate. They eventually hope to stamp narrow features that are only one or two layers thick, by stamping on materials other than silicon oxide. In computer simulations, they found that each material interacts differently with the graphene. So success might rely on finding just the right combination of substrate materials to coax the graphene to break off in one or two layers. This would also tailor the properties of the graphene. Padture’s co-authors on the paper include Dongsheng Li, a postdoctoral researcher, and Wolfgang Windl, associate professor of materials science and engineering. This work was partially funded by the Center for Emergent Materials at Ohio State, which is a Materials Research Science & Engineering Center (MRSEC) sponsored by the National Science Foundation. The $17-million center is one of only 27 MRSECs (http://www.mrsec.org) around the country, and its main research focus is magnetoelectronics. Partial funding was also provided by Ohio State’s Institute for Materials Research.